Attack of the Week: Triple Handshakes (3Shake) | InfoRecon. The other day Apple released a major security update that fixes a number of terrifying things that can happen to your OS/X and iOS devices. You should install it. Not only does this fix a possible remote code execution vulnerability in the JPEG parser (! ), it also patches a TLS/SSL protocol bug known as the “Triple Handshake” vulnerability. And this is great timing, since Triple Handshakes are something I’ve been meaning (and failing) to write about for over a month now. But before we get there: a few points of order. First, if Heartbleed taught us one thing, it’s that when it comes to TLS vulnerabilities, branding is key. Henceforth, and with apologies to Bhargavan, Delignat-Lavaud, Pironti, Fournet and Strub (who actually discovered the attack*), for the rest of this post I will be referring to the vulnerability simply as “3Shake”. On a more serious note, 3Shake is not Heartbleed. That’s both good and bad. It’s good because Heartbleed was nasty and 3Shake really isn’t anywhere near as dangerous. It’s bad since, awful as it was, Heartbleed was only an implementation vulnerability — and one in a single TLS library to boot. 3Shake represents a novel and fundamental bug in the TLS protocol. The final thing you should know about 3Shake is that, according to the cryptographic literature, it shouldn’t exist. You see, in the last few years there have been at least three four major crypto papers purporting to prove the TLS protocol secure. The existence of 3Shake doesn’t make those results wrong. It may, however, indicate that cryptographers need to think a bit more about what ‘secure’ and ‘TLS’ actually mean. For me, that’s the most fascinating implication of this new attack. I’ll proceed with the usual ‘fun’ question-and-answer format I save for this sort of thing. What is TLS and why should you care? Since you’re reading this blog, you probably already know something about TLS. You might even realize how much of our infrastructure is protected by this crazy protocol. In case you don’t: TLS is a secure transport protocol that’s designed to establish communications between two parties, who we’ll refer to as the Client and the Server. The protocol consists of two sub-protocols called the handshake protocol and the record protocol. The handshake is intended to authenticate the two communicating parties and establish shared encryption keys between them. The record protocol uses those keys to exchange data securely. For the purposes of this blog post, we’re going to focus primarily on the handshake protocol, which has (at least) two major variants: the RSA handshake and the Diffie-Hellman handshake (ECDHE/DHE). These are illustrated below. Simplified description of the TLS handshakes. Top: RSA handshake. Bottom: Diffie-Hellman handshake. As much as I love TLS, the protocol is a hot mess. For one thing, it inherits a lot of awful cryptography from its ancient predecessors (SSLv1-3). For another, it’s only really beginning to be subjected torigorous, formal analysis. All this means we’re just now starting to uncover some of the bugs that have been present in the protocol since it was first designed. And we’re likely to discover more! That’s partly because this analysis is at a very early stage. It’s also partly because, from an analysts’ point of view, we’re still trying to figure out exactly what the TLS handshake is supposed to do. Well, what is the TLS handshake supposed to do? Up until this result, we thought we had a reasonable understanding of the purpose of the TLS handshake. It was intended to authenticate one or both sides of the connection, then establish a shared cryptographic secret (called the Master Secret) that could be used to derive cryptographic keys for encrypting application data. The first problem with this understanding is that it’s a bit too simple. There isn’t just one TLS handshake, there are several variants of it. Worse, multiple different handshake types can be used within a single connection. The standard handshake flow is illustrated — without crypto — in the diagram below. In virtually every TLS connection, the server authenticates to the client by sending a public key embedded in a certificate. The client, for its part, can optionally authenticate itself by sending a corresponding certificate and proving it has the signing key. However this client authentication is by no means common. Many TLS connections are authenticated only in one direction. Common TLS handshakes. Left: only server authenticates. Right: client and server both authenticate with certificates. TLS also supports a “renegotiation” handshake that can switch an open connection from one mode to the other. This is typically used to change a connection that was authenticated only in one direction (Server->Client) into a connection that’s authenticated in both directions. 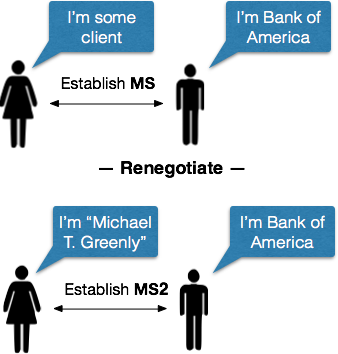 The server usually initiates renegotiation when the client has e.g., asked for a protected resource. Renegotiating a session. A new handshake causes the existing connection to be mutually authenticated. Ray/Dispensa attack from 2009. The attacker first establishes an unauthenticated connection and injects some traffic (“drop table *”). When the server initiates a renegotiation for client authentication, the attacker forwards the new handshake messages to an honest client Alice who then sends real traffic. Since the handshakes are not bound together, Bob views this as a single connection to one party. To fix this, a “secure renegotiation” band-aid to TLS was proposed. The rough idea of this extension was to ‘bind’ the renegotiation handshake to the previous handshake, by having the client present the “Finished” message of the previous handshake. Since the Finished value is (essentially) a hash of the Master Secret and the (hash of) the previous handshake messages, this allows the client to prove that it — not an attacker — truly negotiated the previous connection. All of this brings us back to the question of what the TLS handshake is supposed to do. You see, the renegotiation band-aid now adds some pretty interesting new requirements to the TLS handshake. For one thing, the security of this extension depends on the idea that (1) no two distinct handshakes will happen to use the same Master Secret, and (2) that no two handshakes will have the same handshake messages, ergo (3) no two handshakes will have the same Finished message. Intuitively, this seemed like a pretty safe thing to assume — and indeed, many other systems that do ‘channel binding’ on TLS connections also make this assumption. The 3Shake attack shows that this is not safe to assume at all. It turns out that TLS does a pretty good job of establishing keys with people you’ve authenticated. Unfortunately there’s a caveat. It doesn’t truly guarantee the established key will be unique to your connection. This is a pretty big violation of the assumptions that underlie the “secure renegotiation” fix described above. For example: imagine that Alice is (knowingly) establishing a TLS connection to a server Mallory. It turns out that Mallory can simultaneously — and unknown to Alice — establish a different connection to a second server Bob. Moreover, if Mallory is clever, she can force both connections to use the same “Master Secret” (MS). Mallory creates two connections that use the same Master Secret. 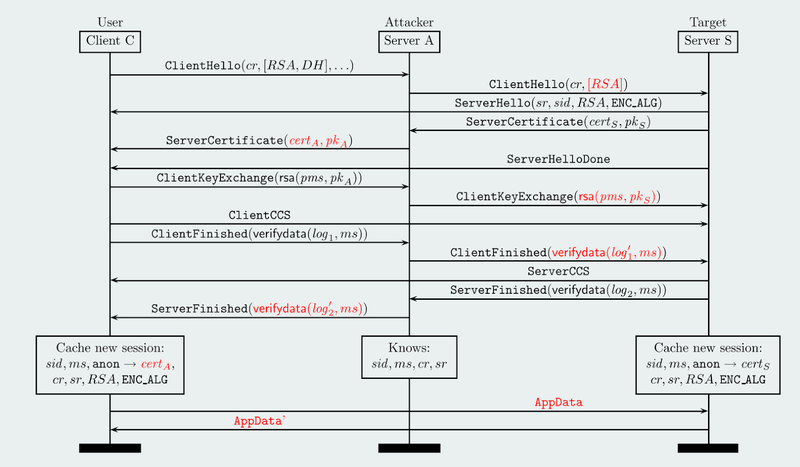 RSA protocol flow from the triple handshake attack (source). The attacker is in the middle, while the client and server are on the left/right respectively. MS is computed as a function of (pms, cr, sr) which are identical in both handshakes. So already we have a flaw in the logic undergirding secure renegotiation. The Master Secret (MS) values are not necessarily distinct between different handshakes. Fortunately, the above attack does not let us resurrect the Ray/Dispensa injection attack. While the attacker has tricked the client into using a specific MS value, the handshake Finished messages — which the client will attach to the renegotiation handshake — will not be the same in both handshakes. That’s because (among other things) the certificates sent on each connection were very different, hence the handshake hashes are not identical. In theory we’re safe. But here is where TLS gets awesome. You see, there is yet another handshake I haven’t told you about. It’s called the “session resumption handshake”, and it allows two parties who’ve previously established a master secret (and still remember it) to resume their session with new encryption keys. The advantage of resumption is that it uses no public-key cryptography or certificates at all, which is supposed to make it faster. Which brings us to the neat thing about this handshake. 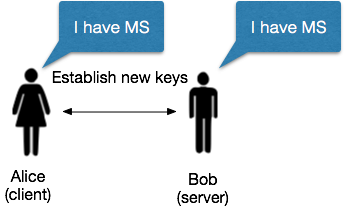 Not only is the MS the same on both connections, but both connections now see exactly the same (resumption) handshake messages. Hence the hash of these handshakes will be identical, which means in turn that their “Finished” message will be identical. Triple handshake attack. The attacker mediates two handshakes that give MS on both sides, but two different handshake hashes. The resumption handshake leaves the same MS and an identical handshake hash on both sides. This means that the Finished message from the resumption handshake will be the same for the connections on either side of the attacker. Now he can hook up the two without anyone noticing that he previously injected traffic. In the above scenario, an attacker first runs a (standard) handshake to force both sides of the connection to use the same MS. It then causes both sides to perform session resumption, which results in both sides using the same MS and having the same handshake hash and Finished messages on both sides. When the server initiates renegotiation, the attacker can forward the third(renegotiation) handshake on to the legitimate client as in the Ray/Dispensa attack — secure in the knowledge that both client and server will expect the same Finished token. There are several, and you can read about them here. One proposed fix is to change the derivation of the Master Secret such that it includes the handshake hash. This should wipe out most of the attacks above. Another fix is to bind the “session resumption” handshake to the original handshake that led to it. Wait, why should I care about injection attacks? You probably don’t, unless you happen to be one of the critical applications that relies on the client authentication and renegotiation features of TLS. In that case, like most applications, you probably assumed that a TLS connection opened with a remote user was actually from that user the whole time, and not from two different users. If you — like most applications — made that assumption, you might also forget to treat the early part of the connection (prior to client authentication) as a completely untrusted bunch of crap. And then you’d be in a world of hurt. What does this have to do with the provable security of TLS? Of all the questions 3Shake raises, this one is the most interesting. As I mentioned earlier, there have been several recent works that purport to prove things about the security of TLS. They’re all quite good, so don’t take any of this as criticism. However, they (with one exception, the miTLS project) didn’t find this attack. Why is that? The first reason is simple: many of these works analyze only the basic TLS handshake, or they omit at least one of the possible handshakes (e.g., resumption). This means they don’t catch the subtle interactions between the resumption handshake, the renegotiation handshake, and extensions — all of which are the exact ingredients that make most TLS attacks possible. The second problem is that we don’t quite know what standard we’re holding TLS to. For example, the common definition of security for TLS is called “Authenticated and Confidential Channel Establishment” (ACCE). Roughly speaking this ensures that two parties can establish a channel and that nobody will be able to determine what data is being sent over said channel. The problem with ACCE is that it’s a definition that was developed specifically so that TLS could satisfy it. As a result, it’s necessarily weak. For example, ACCE does not actually require that each handshake produces a unique Master Secret — one of the flaws that enables this attack — because such a definition was not possible to achieve with the existing TLS protocol. In general this is what happens when you design a protocol first and prove things about it later. What’s the future for TLS? Can’t we throw the whole thing out and start over again? Sure, go ahead and make TLS Rev 2. It can strip out all of this nonsense and start fresh. But before you get cocky, remember — all these crazy features in TLS were put there for a reason. Someone wanted and demanded them. And sadly, this is the difference between a successful, widely-used protocol and your protocol. Your new replacement for TLS might be simple and wonderful today, but that’s only because nobody uses it. Get it out into the wild and before long it too will be every bit as crazy as TLS.